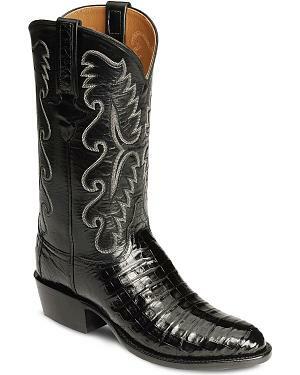 Ferrini Alligator Belly Exotic Cowboy Boots - Medium Toe Made of genuine exotic alligator belly skin on vamp. Shaft is made of smooth calf leather. Classic Ferrini embroidery on 13" shaft. Soft leather lining and padded footbed. 1 3/4" leather cowboy heel and outsole. Handcrafted from globally sourced materials. Each pair of Ferrini boots are handcrafted and include leather soles and linings, orthopedic cushioned footbeds, and the highest quality leathers sourced from all over the globe. Each pair is hand finished with hand-driven wooden pegs. 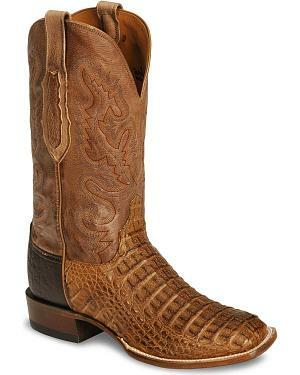 Lucchese Handcrafted Classics Caiman Ultra Belly Cowboy Boots - Medium Toe The ultimate in U.S.A.
handmade exotic boots, Lucchese Classics. Crafted of attention-getting caiman ultra belly leather. Finest leather upper, lining, insole, heel, & sole. Walk in ultimate comfort, thanks to a cushion insole & the exclusive Lucchese Classics last. Proudly crafted in the U.S.A.. The fully handmade Lucchese Classics boot represents a decision to invest in quality; this is a boot you will wear and appreciate for a lifetime. Every inch of every pair of Mens Lucchese Boots are created from only the finest grade leathers, and every step of construction is carefully completed at the hands of skilled craftsmen. Lucchese impresses once again with this luxury exotic western boot. Boot features a caiman ultra belly leather foot and heel counter under a 12" leather shaft. Leather pull straps with caiman belly overlay. Smooth leather sole with rubber grip heel surface. Tony Lama Signature Series Caiman Belly Cowboy Boots - Snip Toe Pre-order your pair of Tony Lama Signature Series caiman cowboy boots..
Tony Lama Signature Series boots - more than Tony Lamas latest line of boots, its their masterpiece..
Caiman belly leather with embroidered genuine full grain leather shaft. Handcrafted leather upper, lining & sole. Lama Comfort Technology Poron ProZorb breathable, moisture-absorbing insole. Tony Lama Boots asks, what makes a work of art priceless? Distinctive style, superb attention to detail, and the signature of an esteemed artist. Handcrafted by master bootmakers, these Tony Lama boots incorporate the finest exotic materials, exquisitely embroidered leather, and cutting edge comfort technology. This mens Tony Lama exotic boot from the Signature Series boasts a caiman belly foot topped by a 13" embroidered leather shaft. 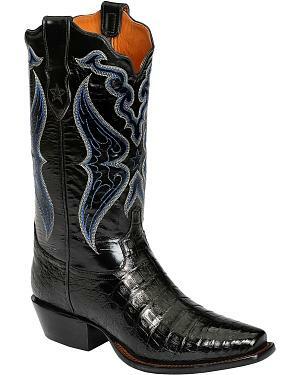 Tony Lama Signature Series Embroidered Caiman Belly Cowboy Boots - Snip Toe Pre-order your pair of Tony Lama Signature Series caiman cowboy boots..
Lucchese Handcrafted Waxy Hornback Caiman Cowboy Boots - Square Toe Lucchese takes a bite out of style with these hornback caiman western boots.. The ultimate in handmade boot construction. 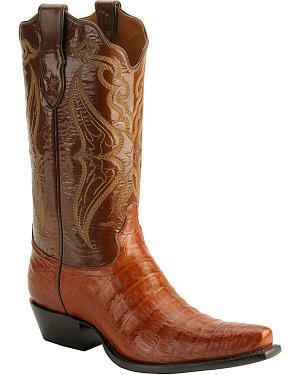 Burnished hornback caiman leather boots. Leather uppers, linings, heels, & smooth soles - marks of a quality boot. Richly detailed with quality craftsmanship, this Lucchese waxy hornback caiman western boot boasts striking elegance and comfort wear! This distinctive boot features a burnished hornback caiman leather foot beneath a 12" fancy stitched leather shaft. Brass nailed smooth leather sole. 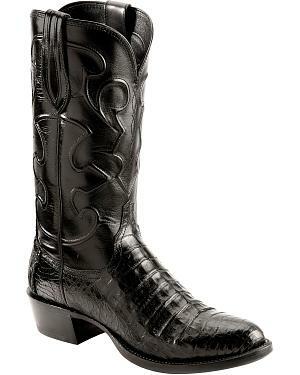 Lucchese Handcrafted 1883 Black Crocodile Belly Cowboy Boots - Round Toe The ultimate in handmade exotic boots, Lucchese..
Genuine black crocodile belly leather vamp. Leather lining, insole, heel, & sole - the finest. Walk in ultimate comfort with a cushion insole. Lucchese boots are 100% handmade. They are the choice of those who know and appreciate the finer things in life - not because of cost, but because of a distinct, unmatched quality. Every inch of every pair of Lucchese boots are created from only the finest grade leathers, and every step of construction is carefully completed at the hands of skilled craftsmen. 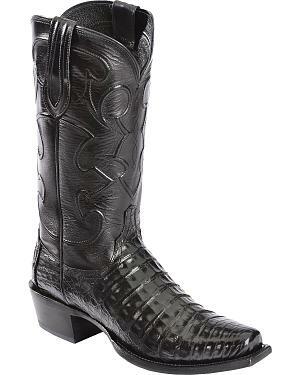 This legendary boot features a black crocodile belly leather foot under a 12 1/2" smooth black leather shaft. Round toe silhouette and 1 3/4" cowboy heel. 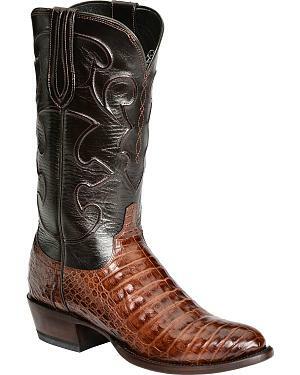 Lucchese Handcrafted 1883 Caiman Belly Cowboy Boots - Round Toe The ultimate in handmade exotic boots, Lucchese..
Genuine sienna caiman belly leather vamp. 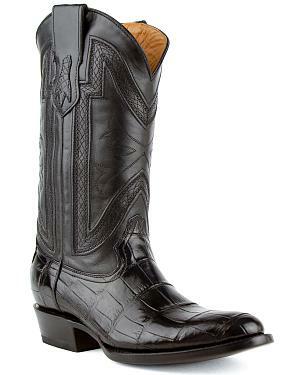 This legendary boot features a sienna caiman belly leather foot under a 12 1/2" smooth black leather shaft. Lucchese Handcrafted 1883 Croc Belly Cowboy Boots - Snoot Toe The ultimate in handmade exotic boots, Lucchese..
Genuine crocodile belly leather vamp. This legendary boot features a crocodile belly leather foot under a 13" leather shaft. Snoot toe and cowboy heel. Helpful shopping tip: Comparison shopping saves time and money and is the smart way to shop. © 2005 - 2019 SaleCrossing.com, a division of Cube 216. All rights reserved worldwide.